Facebook announced the 3D photos feature at the F8 conference in May. The social networking giant has now started rolling out the feature in the News Feed and VR headsets. Facebook 3D photos will allow you to post pictures with a 3D effect, showing the subject in greater detail. The pictures won’t really be 3D, though. It won’t allow you to rotate the picture to view the foreground subject from every angle but you’ll be able to see them from different angles and tilts either within the Facebook app or using Oculus VR headsets. Dual cameras on the iPhone 7 Plus, 8 Plus, iPhone X, XS, and XS Max capture depth data alongside the flat image to create blurred backgrounds in portrait mode. Facebook’s algorithms use that data to understand the three-dimensional characteristics of the scene and simulate them in a 3D photo. It infers what should be there behind the subject if you tilted the perspective. Since portrait images are mostly captured with two cameras simultaneously, the parallax differences could be used to infer and recreate what could be behind the subject. The results are believable and life-like. Though Facebook has started rolling out the feature, not everyone will be able to create 3D photos right now. You need to have a compatible device, and the list of compatible phones is pretty short. Initially, it will work only on the iPhone 7 Plus, iPhone 8 Plus, iPhone X, iPhone XS, and XS Max. The feature is not yet available to Android devices. Facebook has promised to bring it to Android phones with dual rear cameras in the coming weeks. It means owners of devices like Galaxy Note 9, LG V35 and Galaxy S9 Plus will get the ability to create Facebook 3D photos soon. 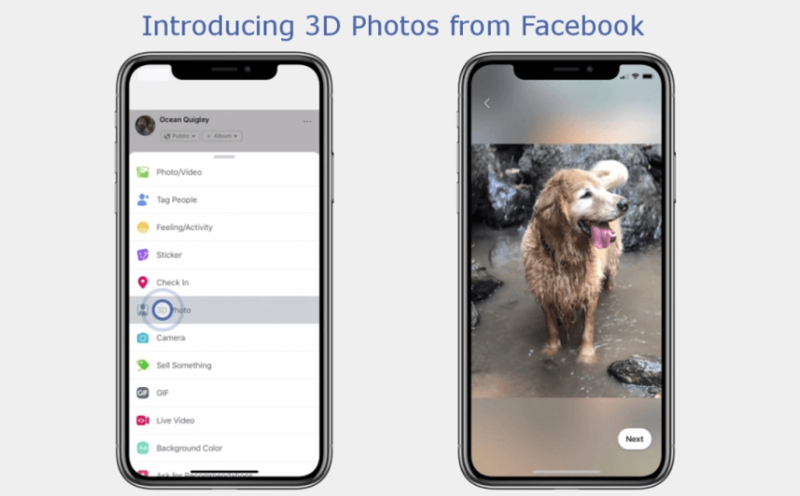 If you have a compatible device, you can create Facebook 3D photos by launching the Facebook app, tapping on the three dots on the status update composer to bring up the list of options, selecting the 3D Photo option, and picking a portrait image from your album. Once you post it, your friends and followers will be able to view it. It will be viewable in the News Feed on desktop, mobile app as well as in virtual reality through the Oculus Browser on Oculus Go or Firefox on Oculus Rift. Facebook recommends that the subject should be 3-4 feet away to get the best results. Also, try capturing the subject with contrasting colors. Distinct colors will allow its algorithms to separate the layers better. You won’t get great results if the subject is wearing a blue shirt in front of a blue wall. Shiny and transparent objects such as glass and plastic could also confuse the algorithms. The social networking giant also suggests that you should capture the subjects that have some solid edges and texture. The creation of 3D photos is currently limited to select iPhones, but viewing is available on all devices. Oculus Go and Oculus Rift users can tap/click and drag or move their head to view the 3D photo from different angles. To view it on the phone, simply scroll or tilt the device to change the perspective. The social networking giant is exploring new ways to keep people glued to their News Feed as users continue to lose interest in Facebook. Videos, live broadcasts, 360-degree images, and 3D photos are all the outcomes of the same effort. It is also encouraging and paying video content creators to create remarkable content for its users. Its entire business relies on keeping users hooked to the News Feed so it could show them more ads.